In 2009, Dr.Roof became a COR registered company and in 2011, completed all the necessary training modules required to achieve COR certification. In other words Dr. Roof operates under a safety program that meets or exceeds all of the COR requirements. Dr. Roof expects to be COR certified in the near future and is currently COR compliant. Ensuring the safety of their employees while performing their work related duties is a top priority for Dr. Roof. 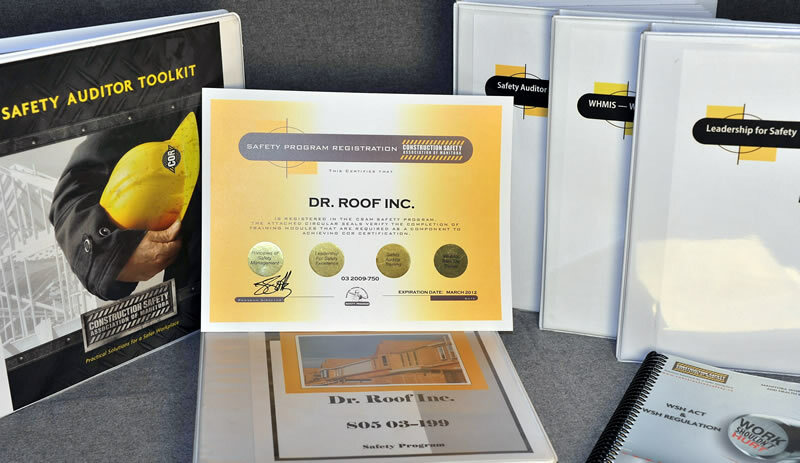 Since 2005 Dr.Roof has taken the time to develop its own company safety program rather than buying someone’s existing program or hiring an outside consultant to build one. This has allowed Dr. Roof to build a program with input from their employees that fit their specific needs. Their safety program is being constantly updated and improved. Everyone at Dr.Roof receives ongoing safety training whether it is in a classroom setting, online or actual onsite training. Dr. Roof’s safety program is being constantly monitored and evaluated. Updates and changes to the program are added to the safety manuals and employees are regularly consulted, informed and trained as required. COR Misconceptions: The truth is companies get COR certified, not the workers. Many COR certified companies hire sub contractors that are not COR certified and do not follow the proper safety requirements. In fact many sub contractors have no safety program whatsoever. At Dr Roof, because all of our workers are employees, everyone is trained and qualified in the proper safety requirements to complete his or her tasks in a safe manner that complies with COR. Building a company safety program from scratch has ensured that everyone at Dr.Roof has learned the safety program and has actually implemented it in real job site situations, not just in a text book setting.